Sri Isopanishad is one of the first books Srila Prabhupada published in the course of establishing the Hare Krishna movement in the Western world. Its eighteen mantras—Vedic hymns—are meant to focus the mind in meditation on the Supreme Person, Krishna. Sri Isopanishad's mantras direct our attention toward how the Supreme Person is the complete whole of existence, and that all manifestations emanating from Him—including our bodies and the world we inhabit—are also complete in and of themselves. The Isa—"supreme controller"—for whom Isopanishad is named, is described as both far away and near, walking and not walking, and both within and outside of everything. In the book's Introduction—adapted from a lecture Srila Prabhupada gave in London in 1968—he explains how the Vedas' teachings are perfect; Vedic sound is not of this world, not created by man, and thus not subject to human frailty and imperfection. Isopanishad is one of the principal Upanishads in Vedic literature that present the ultimate philosophical conclusions of all scripture. Srila Prabhupada composed Sri Isopanishad with the same scholarly standards as his Bhagavad-gita As It Is and Srimad-Bhagavatam, providing the original Sanskrit verse, its English transliteration, word-for-word Sanskrit-English equivalents, translations and purports. In his words, "This makes the book very authentic and scholarly and makes the meaning self-evident." One should know perfectly the Personality of Godhead Sri Krishna and His transcendental name, form, qualities and pastimes, as well as the temporary material creation with its temporary demigods, men and animals. When one knows these, he surpasses death and the ephemeral cosmic manifestation with it, and in the eternal kingdom of God he enjoys his eternal life of bliss and knowledge. By its so-called advancement of knowledge, human civilization has created many material things, including spaceships and atomic energy. Yet it has failed to create a situation in which people need not die, take birth again, become old or suffer from disease. Whenever an intelligent man raises the question of these miseries before a so-called scientist, the scientist very cleverly replies that material science is progressing and that ultimately it will be possible to render man deathless, ageless and diseaseless. Such answers prove the scientists’ gross ignorance of material nature. In material nature, everyone is under the stringent laws of matter and must pass through six stages of existence: birth, growth, maintenance, production of by-products, deterioration and finally death. No one in contact with material nature can be beyond these six laws of transformation; therefore no one—whether demigod, man, animal or plant—can survive forever in the material world. The duration of life varies according to species. Lord Brahma, the chief living being within this material universe, lives for millions and millions of years, while a minute germ lives for some hours only. But no one in the material world can survive eternally. Things are born or created under certain conditions, they stay for some time, and, if they continue to live, they grow, procreate, gradually dwindle and finally vanish. According to these laws, even the Brahmas, of which there are millions in different universes, are all liable to death either today or tomorrow. Therefore the entire material universe is called Martyaloka, the place of death. Material scientists and politicians are trying to make this place deathless because they have no information of the deathless spiritual nature. This is due to their ignorance of the Vedic literature, which contains full knowledge confirmed by mature transcendental experience. Unfortunately, modern man is averse to receiving knowledge from the Vedas, Puranas and other scriptures. 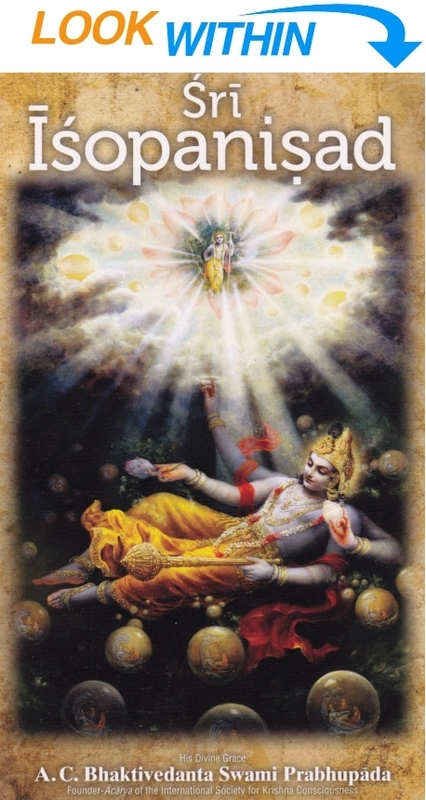 No one can dominate Krishna. It is the conditioned soul who tries to dominate material nature and is instead subjected to the laws of material nature and the sufferings of repeated birth and death. The Lord comes here to reestablish the principles of religion, and the basic principle is the development of an attitude of surrender to Him. This is the Lord’s last instruction in the Bhagavad-gita (18.66): sarva-dharman parityajya mam ekam sharanam vraja. “Give up all other processes and just surrender unto Me alone.” Unfortunately, foolish men have misinterpreted this prime teaching and misled the masses of people in diverse ways. People have been urged to open hospitals but not to educate themselves to enter into the spiritual kingdom by devotional service. They have been taught to take interest only in temporary relief work, which can never bring real happiness to the living entity. They start varieties of public and semi-governmental institutions to tackle the devastating power of nature, but they don’t know how to pacify insurmountable nature. Many men are advertised as great scholars of the Bhagavad-gita, but they overlook the Gita’s message, by which material nature can be pacified. Powerful nature can be pacified only by the awakening of God consciousness, as clearly pointed out in the Bhagavad-gita (7.14). In this mantra, Sri Ishopanishad teaches that one must perfectly know both sambhuti (the Personality of Godhead) and vinasha (the temporary material manifestation), side by side. By knowing the material manifestation alone, one cannot be saved, for in the course of nature there is devastation at every moment (ahany ahani bhutani gacchantiha yama-layam). Nor can one be saved from these devastations by the opening of hospitals. One can be saved only by complete knowledge of the eternal life of bliss and awareness. The whole Vedic scheme is meant to educate men in this art of attaining eternal life. People are often misguided by temporary attractive things based on sense gratification, but service rendered to the sense objects is both misleading and degrading. We must therefore save ourselves and our fellow man in the right way. There is no question of liking or disliking the truth. It is there. If we want to be saved from repeated birth and death, we must take to the devotional service of the Lord. There can be no compromise, for this is a matter of necessity. The Complete Whole, or the Supreme Absolute Truth, is the complete Personality of Godhead. Realization of impersonal Brahman or of Paramatma, the Supersoul, is incomplete realization of the Absolute Complete. The Supreme Personality of Godhead is sac-cid-ananda-vigraha (Bs. 5.1). Realization of impersonal Brahman is realization of His sat feature, or His aspect of eternity, and Paramatma realization is realization of His sat and cit features, His aspects of eternity and knowledge. But realization of the Personality of Godhead is realization of all the transcendental features—sat, cit and ananda, bliss. When one realizes the Supreme Person, he realizes these aspects of the Absolute Truth in their completeness. Vigraha means “form. ” Thus the Complete Whole is not formless. If He were formless, or if He were less than His creation in any other way, He could not be complete. The Complete Whole must contain everything both within and beyond our experience; otherwise He cannot be complete. The Complete Whole, the Personality of Godhead, has immense potencies, all of which are as complete as He is. Thus this phenomenal world is also complete in itself. The twenty-four elements of which this material universe is a temporary manifestation are arranged to produce everything necessary for the maintenance and subsistence of this universe. No other unit in the universe need make an extraneous effort to try to maintain the universe. The universe functions on its own time scale, which is fixed by the energy of the Complete Whole, and when that schedule is completed, this temporary manifestation will be annihilated by the complete arrangement of the Complete Whole. All facilities are given to the small complete units (namely the living beings) to enable them to realize the Complete Whole. All forms of incompleteness are experienced due to incomplete knowledge of the Complete Whole. The human form of life is a complete manifestation of the consciousness of the living being, and it is obtained after evolving through 8,400,000 species of life in the cycle of birth and death. If in this human life of full consciousness the living entity does not realize his completeness in relation to the Complete Whole, he loses the chance to realize his completeness and is again put into the evolutionary cycle by the law of material nature. Because we do not know that there is a complete arrangement in nature for our maintenance, we make efforts to utilize the resources of nature to create a so-called complete life of sense enjoyment. Because the living entity cannot enjoy the life of the senses without being dovetailed with the Complete Whole, the misleading life of sense enjoyment is illusion. The hand of a body is a complete unit only as long as it is attached to the complete body. When the hand is severed from the body, it may appear like a hand, but it actually has none of the potencies of a hand. Similarly, living beings are part and parcel of the Complete Whole, and if they are severed from the Complete Whole, the illusory representation of completeness cannot fully satisfy them. The completeness of human life can be realized only when one engages in the service of the Complete Whole. All services in this world—whether social, political, communal, international or even interplanetary—will remain incomplete until they are dovetailed with the Complete Whole. When everything is dovetailed with the Complete Whole, the attached parts and parcels also become complete in themselves.